Pictured above, the many faces of Halloween at Streamway Villa. 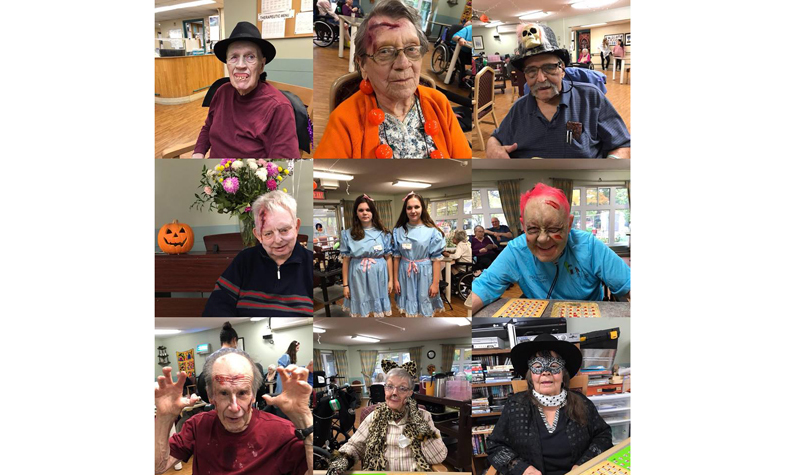 Streamway Villa life enrichment co-ordinator (LEC) Christina Doughty is commending her colleagues at the Cobourg long-term care home for their strong enthusiasm which gave residents a Halloween to remember. Of note, Christina says life enrichment aide Tracey Neville, who has a knack for putting makeup on people and getting residents dressed up in Halloween gear, particularly shined this year, getting residents ready for the day’s events. There was a Halloween bingo in the afternoon, and then a Halloween party in the evening of Oct. 31. Christina says residents’ family members also played a large role in ensuring their loved ones enjoyed Halloween. Over the years Streamway Villa has built a large collection of costumes that are always at the ready, so those residents who did not have costumes brought in for them had a plethora of designs to choose from, Christina says. Adding to the fun was the high level of participation from staff members.